Chef Jose Hernandez of Houston restaurant, Radio Milano created this prosciutto appetizer to spotlight Prosciutto di Parma at the whole-hog culinary competition, Cochon555 in Houston, Texas. This Caponata Bruschetta with prosciutto appetizer is a fresh take on a Sicilian classic, using rich ingredients like Prosciutto di Parma, eggplant, aged balsamic vinegar and toasted walnuts. This dish can be served as an appetizer or as a hearty side dish that is guaranteed to leave a lasting impression with your guests. Place pugliese bread on a baking sheet, brush with 1/2 tablespoon olive oil and season with salt and pepper; toast until golden brown, about 5 minutes. Set aside. To make the caponata, chop the eggplant into an even dice. Heat 2 tablespoons olive oil in a large, thick-bottomed pan, over medium heat, until it starts to give off its fragrance. Add the eggplant; saute until it softens and turns brown. Remove and set aside. Chop celery heart and stalks; set aside. Dice the onions roughly and saute in 1 tablespoon olive oil in the same pan until soft and translucent. Add the chopped celery heart and stalks, the dates, capers, olives and tomato puree and stir until the celery is tender, about five minutes. Add the cooked eggplant and shredded basil to the pan and cook, stirring gently, for another 10 minutes. Add the vinegar and sugar, cook for another five minutes to take the edge off the vinegar, and season with nutmeg, salt and pepper, to taste. 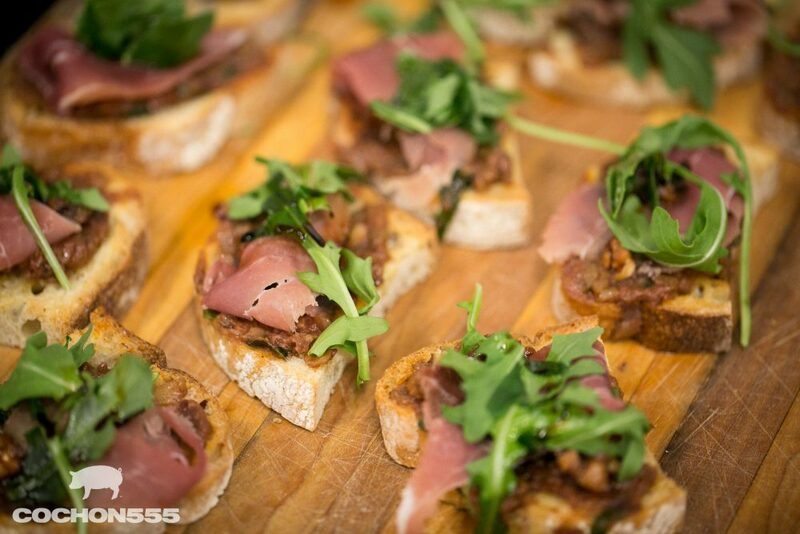 To plate the dish, spread pugliese toast with the caponata and top with fresh arugula, a slice of Prosciutto di Parma, toasted walnuts and finish with aged balsamic.